Before I dive into this post any further, I just want to thank everyone for the words, thoughts and prayers of comfort and encouragement the past few days. 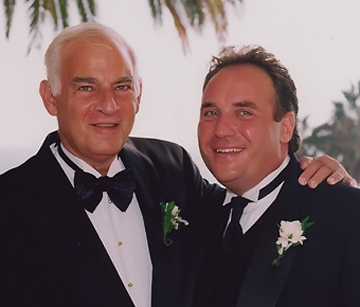 The impending loss of my father, though a blessing on many levels, had been difficult for me to fully accept. With your help and support, however, I am coping much better and see that sometimes a loss can actually be a sort of “gain”. Another thing that has helped has been preparing the new cave for our move … now just one week away. Spending every waking moment trying to get the place ready has distracted me from the emotional rollercoaster that I have been given a front-seat ticket for. Today, the granite guys arrived and began tearing the kitchen apart and installing the new counter tops. I left before they finished their day, but I know they’ll be back tomorrow to take care of the bathrooms. What amazes me is that they will be doing our whole house (kitchen and 2.5 bathrooms) for less than what I expected to pay for just the kitchen! In fact, I am so impressed with their selection and prices that I am going to be selling their wares on the side. 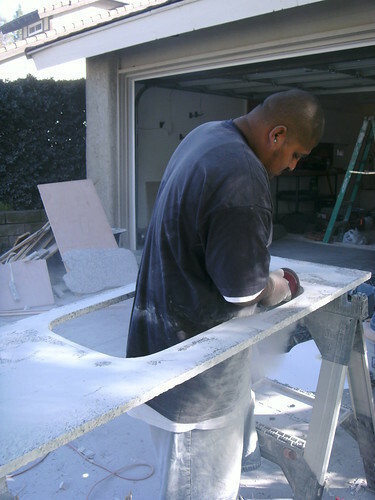 Anyone in So Cal need/want new counter tops??? 😉 Actually, I’ve already made two sales based just on what I was able to get from these guys … yeah, it’s that good of a deal! Obviously, time is at a premium right now. So, for the next week or so, my postings here will be sparse at best. I hope you’ll understand and check back to see if I’ve freed myself long enough to get something tasty up on here. In the meantime, feel free to check out the Cavewoman’s Flickr photostream to see visual updates of what’s going on at our new home. The tenting pictures are kind of cool, and the granite install process is definitely worth a look. If you don’t have time to browse through all the pics, no worries. I’ll be posting before and after pics of all the major work we have to do, once it is all completed. Thank you again for the love and friendship. I feel genuinely blessed and fortunate. Today has been a very interesting day for me. I don’t think I have ever experienced such extreme emotional swings as I have today. A day that I was hoping to spend on the proverbial “Cloud 9” … and, for what seemed like the briefest of moments, I was. 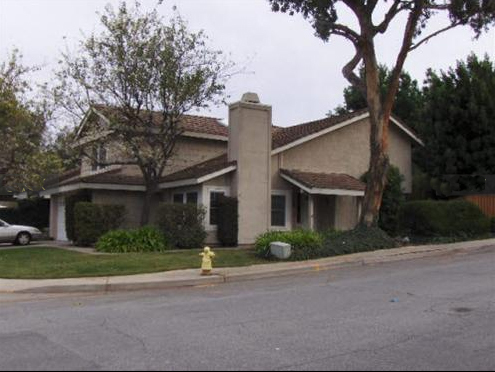 Today was the day we were supposed to close escrow on our new Cavehold in a lovely area of California known as Thousand Oaks. The excitement and anticipation was palpable. I had even prepared a post to share with you our new abode, that I didn’t want to publish until it was official so as to not “jinx” the whole deal. The phone finally rang and our realtor told us the good news – the house was indeed ours! Although my son was in school, my daughter had the day off. So, the Cavewoman and I decided the three of us would go out for a celebratory lunch at our favorite Middle Eastern restaurant, Habyit in West LA. I even had planned to take some pictures and do a write up of this great family-run bistro. But, suddenly, I was rocked to the core of my soul and rudely shaken from my moment of bliss. Just as we finished placing our order my cell phone rang … it was my step-mother. She and my father have been married for nearly 31 years. He was a brilliant research doctor and Chief of Hematology at the National Institute of Health (NIH) for over 30 years until about 1997 when he was diagnosed with Alzheimer’s Disease. You might have seen his story chronicled on an edition of Frontline on PBS a couple of years ago, or just this past year on an ABC Nightly News feature. Personally, I couldn’t think of a more cruel disease for a man who’s intellect was the one most important thing to him in his life. That cerebral, academic drive created a distance between us, yet saved and lengthened so many lives. I have always understood, but didn’t always graciously accept, that chasm in our relationship. I knew deep down that it was necessary for the “greater good”. And, despite the distance we had to travel to be part of each other’s lives, or to attempt to see life through the same eyes, the love we had for one and other was never questioned. For the last 10 years or so, my father hasn’t really known who I was; he seemed to loose all communication skills about five years ago; and, even though there were occasional brief moments of distant recognition of what was being said to him, he seemed to have already left this world quite some ago. So, when that phone rang today, and my step-mother told me that my dad had stopped eating and drinking over the weekend, I probably should have been better prepared. I probably should have viewed his impending passing as a kind of blessing, a release from his mind-clouded prison. I probably should have thanked the powers that be for finally giving my father, step-mother and entire family some long overdue relief. Instead, however, I was selfishly devastated by the thought of losing a parent, and angry that the moment of home-purchase rapture we had worked so hard for the past year had been sullied by this sad news. I excused myself from lunch, telling my wife to go ahead and finish, headed to the car to shed a few tears for my dear old Dad, and called the Cavemom to inform her of her first husband’s short fututre. I cursed the powers that be and started making plans with myself to wallow in sorrow the rest of the day. Of course, being the wonderful person she is, the Cavewoman ignored me, got everything wrapped up, paid the bill and was in the car with my daughter consoling me in what seemed like about a minute or so. That was my first inkling that I needed to get past myself and my regrets and tend to the many other parts of my life that need care and attention. I finished my conversation with my Mom, who said she’d readily accompany me to St. Louis (dad’s 1st hometown) when it comes time for the funeral, and felt even more balanced. Then, after picking up my son at school (itself a life affirming act on many levels), I decided I better check my e-mail. And, there it was! A kind, generous gesture from a near complete stranger that fully opened my eyes. I received word from PT of the blog ptsaldari that she was using a recent comment of mine on her blog as an actual post. I clicked the link, read the words she wrote, and was amazed to feel a smile come across my face and warmth enter my heart on a day I thought neither would be possible. It reminded me that no matter how thick the cloud cover may be, the sun never stops shining. It works it’s tail off just to try and get one ray of light past the darkness. And, here I am, surrounded by all these rays of light from family, friends, and even people I’ve never personally met, and how lucky I am to have them show me a way out of the emotional abyss I found myself in. If you have a prayer or good thought to share, please send it to my dad, Harvey, for a quick and easy passing. His suffering is long overdue to come to an end. I’m still a bit shell shocked, but I’ll be fine. I’m sure when the next call comes it will be hard, though being prepared will most likely help a bit. I’ll certainly take comfort in the knowledge that the sun never sleeps, and my personal rays of light are all around me if I just keep my eyes open. I went fishing! WoooHOOOO!! Yeah, I know I actually went fishing once already this year … a quick jaunt to the beach for some Winter surf fishing. But, I hadn’t targeted my favorite species, the Largemouth Bass, since last year – a long time for me. As you might know, I have been totally consumed with the sale of our house, purchasing a new one, and packing to make the move. So, fishing has, unfortunately, taken a back seat and probably will for at least another month. However, it was this overwhelming undertaking that actually afforded me 50 minutes of relaxing, mind clearing, rod bending bliss in the great outdoors due to an unplanned but urgently necessary trip to the escrow office in Westlake Village. Actually, it wasn’t very relaxing because the cell didn’t stop ringing, as we are attempting to put the finishing touches on our new purchase by this Monday. It rang so much, in fact, that my phone battery folded under the constant pressure. I can’t complain, though, because I actually caught a couple of fish in between calls! It’s official! We’re moving!! 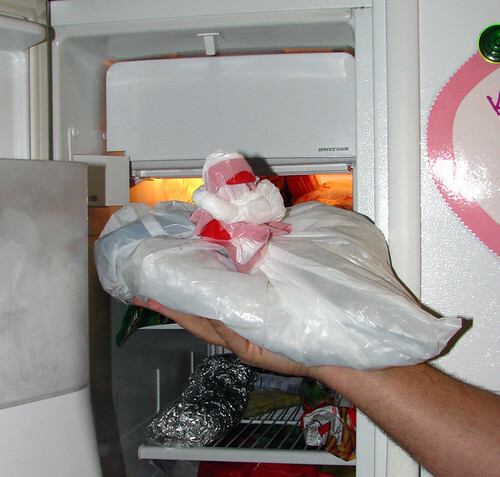 So, I have been given a “request” by the Cavewoman to empty the freezer before we hit the road. The pressure is on! No, I haven’t forgotten about this icy quest. Between the Super Bowl, Valentines Day, house-buying (40 miles away), packing, and all the other daily endeavors we all face it has just been put on hold. But, with D-day now less than three weeks away it was definitely time to get busy on creating complete vacancy in the ice box. So, it was with great delight, that I found the leftovers from the Holiday dinner Cavemom had made for us almost two months ago (where does the time go?!?). 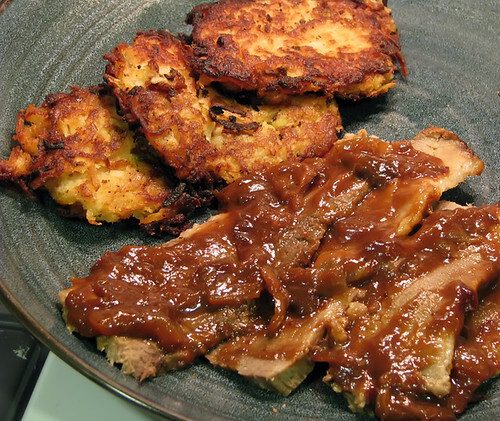 While there was no Chopped Liver, homemade Apple Sauce, Cole Slaw, and other festive dishes were nowhere to be found in the oversized plastic bag, there was enough of her traditional Hanukkah faire of Beef Brisket and Potato Pancakes to feed the Cavekids and me one more time. My mom has always given her brisket a double dose of flavor by first dry rubbing it before cooking it, and then adding a special slightly sweet yet tangy sauce to go over it after slicing. 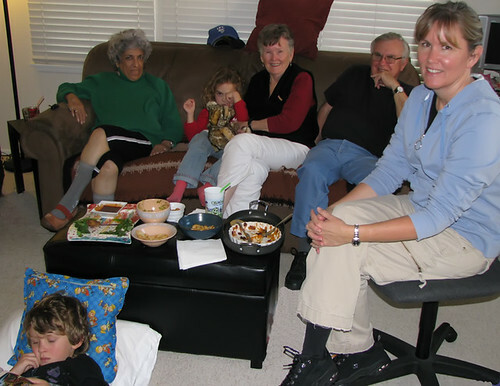 It is always a hit with family and friends. However, as good as the meat is, it is her Latkas that are the chef d’oeuvre everyone clamors for. They’re made with shredded spuds, onions, apples and a host of other ingredients that combine to make a delectable tuber disk that you just can’t get enough of. The good news is that when Cavemom made this batch, I helped, took pics and jotted down the recipe … so, I’ll be sharing it in the next day or so. But, for this redux of this fabulous meal, all I had to do was throw the foil wrapped packets of meat and potatoes into a 375° oven for 25 minutes and zap the sauce for a minute. I have to admit, I am not a big fan of frozen/reheated brisket because it tends to dry out a bit. Such was the case here, though it was still very flavorful. 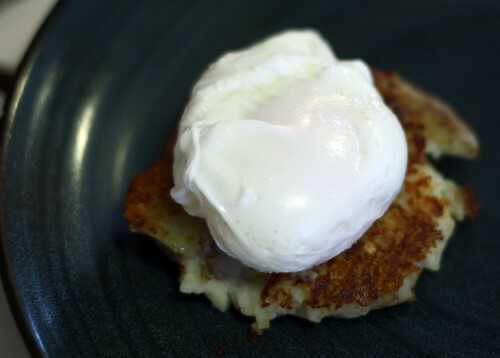 The potato pancakes, on the other hand, came out almost as delicious as the day we made them. Topped with a little apple sauce, they were MmmmMMMM gooood!!! Now, back to the home-purchase insanity and the house-packing lunacy! 😮 If my head spontaneously combusts, you’ll understand!! Before you dive any deeper into this post, I suggest you first check out the 2x Baked Potatoes recipe I posted a few days ago. Otherwise, it is kind of like tuning in to the middle of a television series and trying to understand what is going on … frustrating and futile! (That is something I often do to the Cavewoman, driving her crazy with my questions about who is doing what to who. But, that is a whole other Oprah ;)). In fact, I’m going to go so far as to say that you really should try the recipe first before reading further here. Because, without tasting these in their pristine, just-made state you can’t begin to comprehend just how incredibly delectable these leftover potatoes can possibly be. Okay … so … you’ve made this sinful yet necessary side dish, tasted their incredible flavor, and eaten as many as you could conceivably fit into your not-large-enough-for-something-this-good stomach. And now, you are wondering what to do with the inevitable leftovers. You can’t eat any more of them right now … though you wish you could. You don’t want to use them as furniture coasters … they’re too good to meet such a mundane fate. You won’t want to use them as hockey pucks … no matter how long you let them petrify for they just don’t fly right. So, what do you do??? First, you put them into an airtight container and throw them into the fridge. Then, you spend the rest of the evening coming up with future ideas for these tantalizing taters. Of course, you can just warm them up and enjoy them along side any main dish … they reheat very well and taste almost as good as fresh out of the oven. But, even a pea-sized Caveman’s brain begins to wonder about the possibilities, and dream of the new mouthwatering potential inherent. 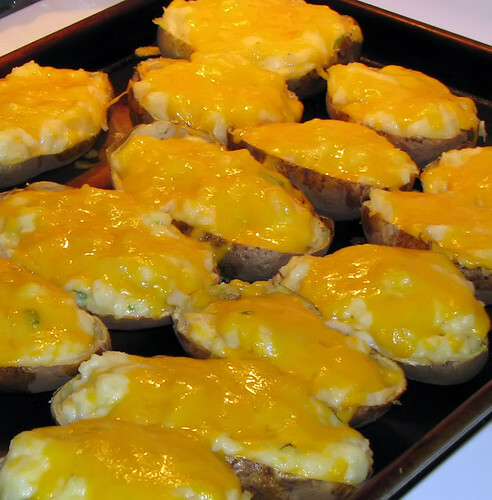 Another wonderful and tempting way to utilize a leftover twice baked tater is pictured above. 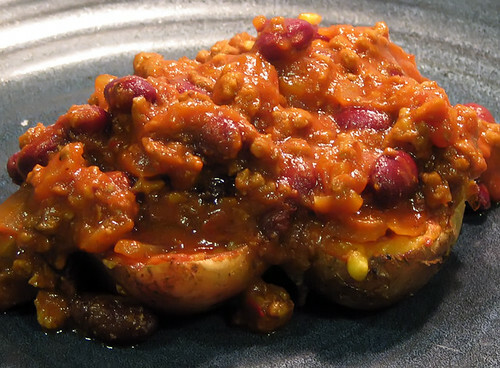 Just reheat the rebaked spud and slather it up with some warmed 2+2 Tequila Chili. Sure you are taking one totally decadent dish and topping it with another … but, I don’t hear too many people complaining about putting a couple of slices of bacon on their burger, a dollop of bearnaise sauce on their steak, or whip cream on their milk shake. So, please, don’t judge! 😉 Besides, you really should taste it first before you say, “Naw! I couldn’t! !” Yeah, it’s that good. However, the true piace de resistance is the breakfast rendition of this thrice utilized tuber: the 2x Baked Poachtato, seen here. 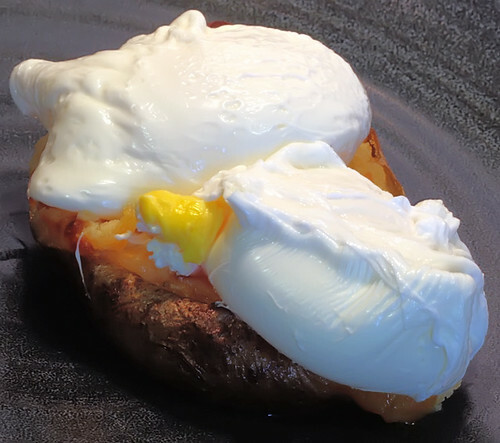 While you are getting them back to optimum temperature in a 375° oven, follow the directions in this recipe for poaching an egg, and throw one or two on top of each re-warmed tater. 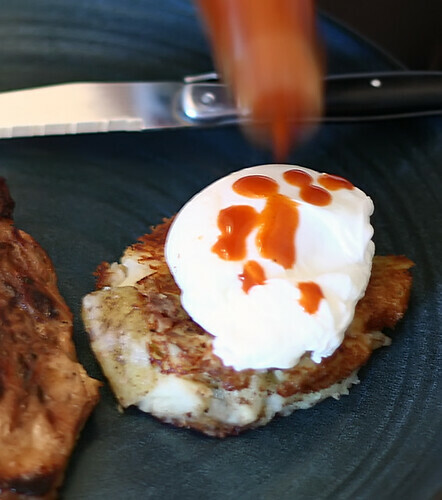 Dab a little of your favorite hot sauce on top (I prefer Tapatio or Tabasco, depending on my tastebuds’ mood) and you have a warm hearty breakfast that will kick your motor into gear. Even the Cavewoman couldn’t get enough of the flavor combination this pairing provides. These are, obviously, not the only uses for a left behind 2-baker. Let your imagination fly when you have some of these rattling around in the fridge … go for it! Just be sure to come back here and let us know what you came up with. We will want to try it, too! If you head to Koreatown (affectionately known to LA locals as “K-town”) you can find any number of tasty, authentic Korean barbeque restaurants. But, if you are on the Westside of town craving kimchi, fish cakes, marinated meats, and a table with a big round grill carved into the center of it for you to cook the meats yourself, then you were out of luck. With the remodel of Culver City’s old Fox Hills Mall into the new Westfield Fox Hills has come a slew of new food establishments, including Manna BBQ. From the numerous grill tables, to the call buttons to summon your waitperson, to the traditional menu selections, Manna is as authentic as they come. 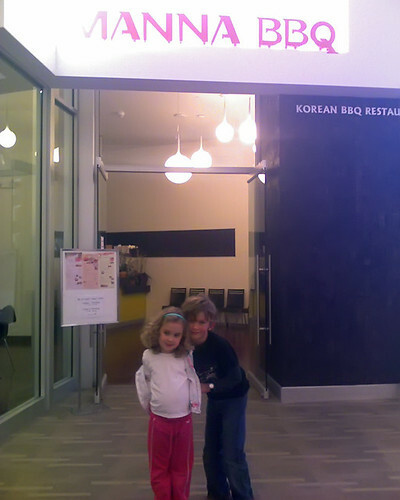 Yeah, that’s right … real sit-down, full serivce Korean BBQ in a mall! These may be the “Angioplasty Special”, but they are so amazingly good you won’t care! Preheat oven to 400°. 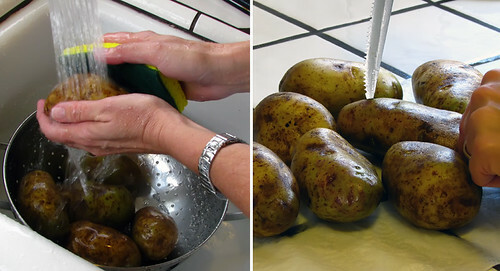 Scrub and rinse potatoes. 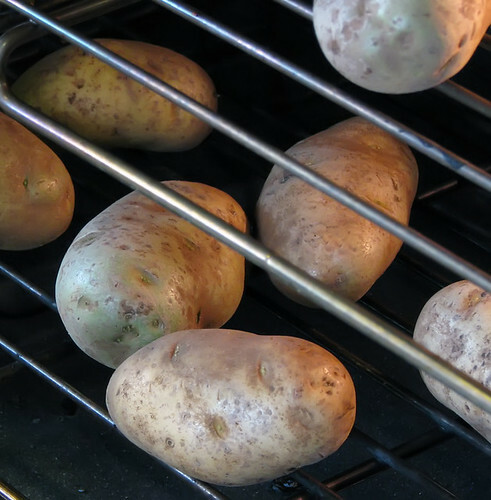 With a pointed knife or fork, stab potatoes several times to prevent them from blowing up in the oven … yeah, it happens! Place potatoes into oven, directly on rack. Bake for 60-70 minutes. HINT #1: Don’t over bake them or the skins get too tough and chewy. We blew it just by going 75 minutes! 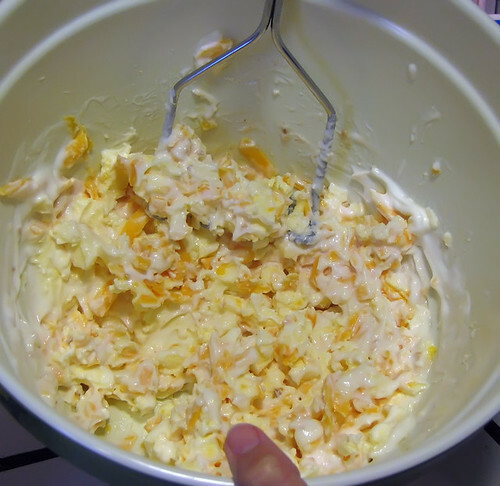 Place ONE cup of the cheese, butter, sour cream, garlic, seasoned salt and pepper into a bowl. Mix well using a zig-zag wire potato masher. When potatoes are done, remove from the oven. Carefully slice potatoes in half lengthwise. 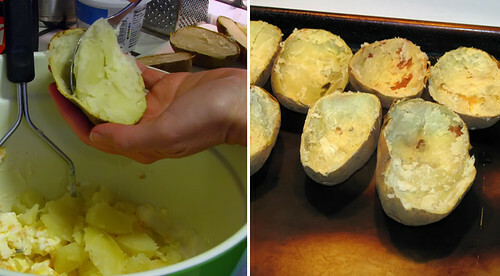 Use a dry rag or clean potholder to hold the potatoes and scoop out the “meat” into the bowl, leaving the skin intact. Put the skins on an ungreased baking pan. NOTE #1: I have to call something in this dish “meat” … I’m a Caveman. Mash potato “meat” together well with cheese mixture. Then, fold in the green onion. Adjust seasonings, if necessary. 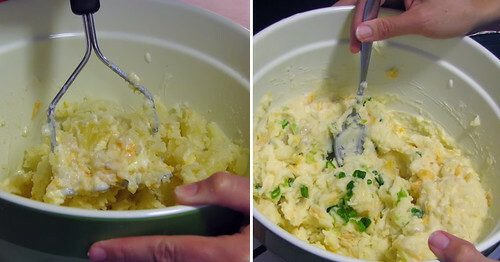 Spoon enough of the potato/cheese mixture into the empty skins so that it doesn’t quite fill up the skin. Then, top each one with some more shredded cheddar cheese. NOTE #2: You’ll likely have some leftover filling … go ahead … eat it! MmmmmMMMMMM!! Place potatoes halves back into the oven for about 20 minutes. Potatoes should be hot and cheese well melted. 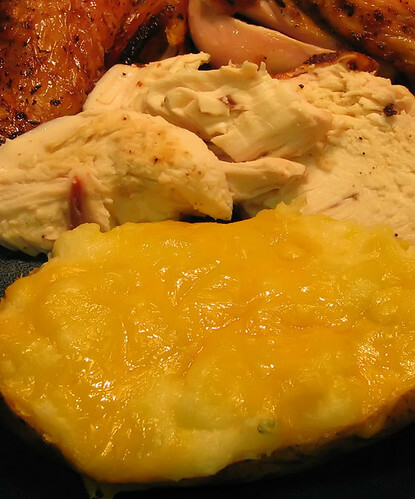 Remove from oven and enjoy as a side dish to just about any meal. Served here with Juicy Beer Can Chicken. HINT #2: Yes, you’ll have plenty for leftovers. But, they reheat very well, plus there are some other things you can do with these babies. Check out 2nd Day 2x Baked Potatoes. What a day! A good game, great food (if I do say so myself), and a fantastic time was had by all. Actually, this Super Sunday actually started on Saturday with the making of the 2+2 Tequila Chili and the Lamb Wontons. Stews and Chilies are always better the second day, and by making and freezing the wontons ahead of time the game-day workload was greatly reduced. 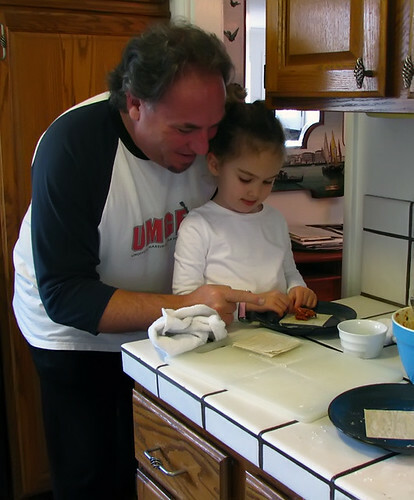 My personal workload was lightened even more by the assistance of the Cavegirl in the making of the wontons. I just showed her how to do it once and then she was off to the races making some perfect “Bishop’s Hats”. She was so proud today when everyone complimented her on how professional her wontons looked … and I was proud that my little girl is already showing some great culinary talent at the tender age of four. I didn’t make any variations in the wonton recipe. Though, I did experiment a bit with the dipping sauce. 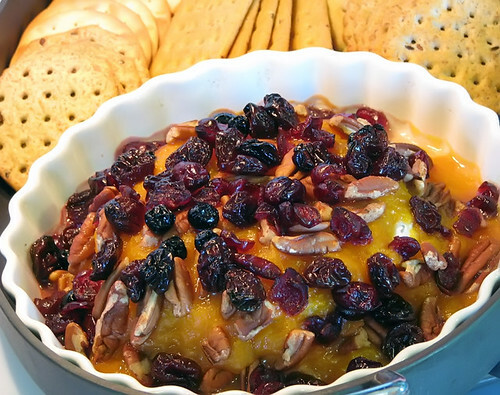 I took 4 tablespoons of store-bought plum sauce and combined it with 2.5 teaspoons of apricot juice (reserved from the canned apricots I used for the baked brie described below), 1/4 teaspoon ground chili oil, 1/4 teaspoon fresh fine-grated ginger, and a few drips of chili sesame oil. 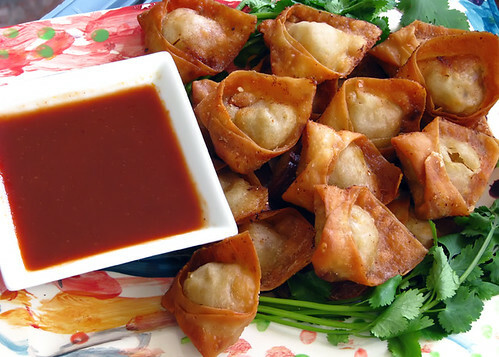 Turned out to be a nice sweet and tangy sauce that flattered the the bold, rich flavor of the wontons. Almost tasted like a samosa with a sweet chutney sauce. Speaking of the Baked Brie with Peach Sauce, I did make a few adjustments to the usual recipe. For one, instead of using peach sauce I made an apricot sauce that just may be a better compliment to the brie. So, I guess it was really a Baked Brie with Apricot Sauce. 😉 Also, instead of just some dried cherries I found a trio medley that also included dried blueberries and cranberries … definitely an improvement! For some reason, however, the oven wasn’t cooking as hot as usual. As a result, the cheese could have used another 5 minutes or so. It still was absolutely delicious … even the Cavekids were mowing on the pungent cheese. Unfortunately, we had a few last minute cancellations, so our menu changed and contracted slightly. 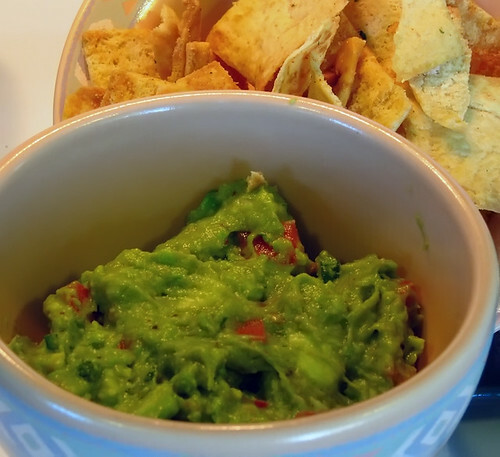 Instead of the planned Crab Dip and Crudites we switched over to some Rockin’ Guac with Garlic Parmesan Pita Chips … a little lighter than the crustacean filled creamy dip and a bit more veggie friendly for the Cavewoman. Besides, we had just gotten a new shipment of homegrown avocados from the Cave-in-laws and a couple of them were just ripe enough – using the mini food processor on them didn’t hurt either. I must say that the Fuerte variety that they grow are, by far, my favorite type of avo. They are so creamy and buttery, you just don’t want to stop eating them … which can be a problem. 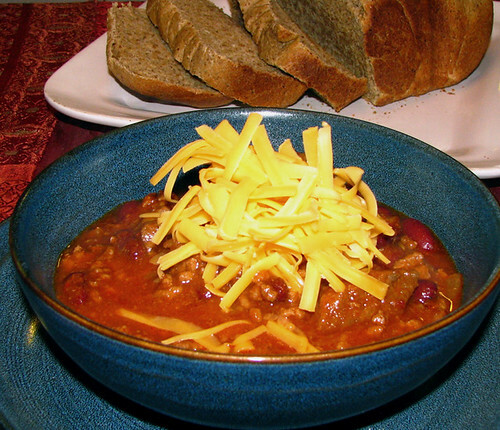 The Chili is one of those recipes that is set in stone. If I messed with it, even if it worked, there would certainly be a “mutiny on the chili-bowl”. Instead of inviting an insurgency, I opted to make a second chili. A veggie version of the traditional 2+2 Tequila Chili. Unfortunately, I didn’t quite get the balance of ingredients right with the lesser amounts of veggie meat (Morningstar Crumbles), which also doesn’t impart the same flavors into the dish that the real deal does. Though, I think that with some tweeking, I can make a veggie version that will rock the herbivore crowd the way the carnivores were today. Regrettably, I didn’t take a shot of the Chili course when plated … yeah, I jelled! 😐 But, if you really need to see what it looked exactly like, see this photo. Before we get to dessert, let’s talk about the game. The final score (34-17) doesn’t represent the hard-fought, see-saw battle that this Super Bowl truly was. I think the only people who weren’t happy after this game were the Colts’ fans and the much publicized guy who bet $1Million on them to win straight up (what a Du-mah!). The game had it all: a ten point turn around (only the second time in SB history), goal line stands, an “onside kick” to start the second half, and a rockin’ half-time show from The Who that had the whole stadium singing every song. Not to mention, the end result was sweet redemption for QB Drew Brees, the Saints organization, and the city and people of New Orleans. You can’t help but enjoy a show like that! As for the much lauded Super Bowl commercials, most were ok at best. But a few caught our collective eye: Puxatawny Palamau, Snickers with Betty White & Abe Vigoda, and the VW “Punch” spot with Stevie Wonder and Tracy Morgan at the end. Yeah, I know, I’ve ranted enough and it’s time for dessert. As usual, the Cavewoman was in charge of the sweet portion of our menu. 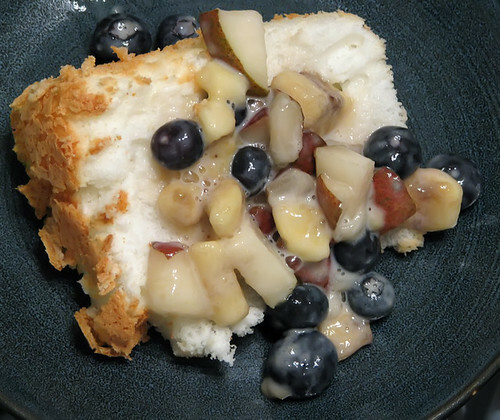 After all the rich foods we were consuming, she went for something a little lighter: an Angel Food Cake topped with Nectar of the Gods Fruit Salad. I don’t want to give away the whole recipe since she promised to post it this week, but it was sooooooooo good with the sweetened fruit and light, airy cake combining for a perfect capper on a delicious day! Hope your Super Sunday was as fun and flavorful! ©2010 Caution: Caveman Cooking/UHearMe, Inc. All rights reserved. 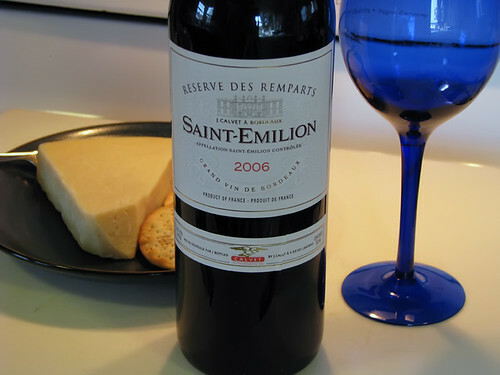 This post originally appeared on the Caution: Caveman Cooking blog at http://cavemancooking.net authored by Caveman. This post may be shared and reprinted as long as this entire copyright message accompanies it. 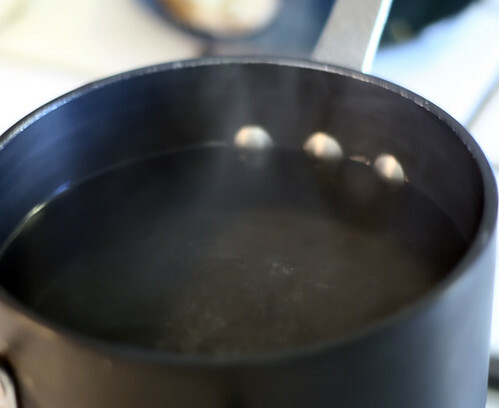 Bring water and vinegar just to a boil, then lower flame to keep the water gently moving, just under a boil. HINT #1: Proper water temperature is key to getting a good free-boiled poached egg. Water temp should be about 170° to 190°, depending on altitude. 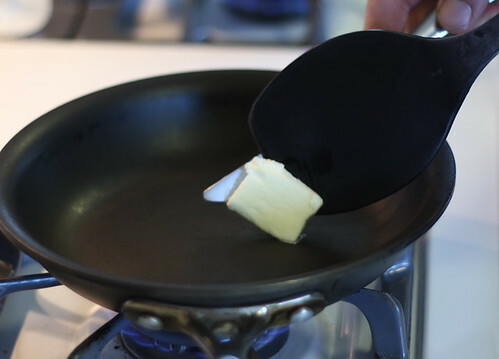 When water is ready, melt butter in a skillet or fry pan. 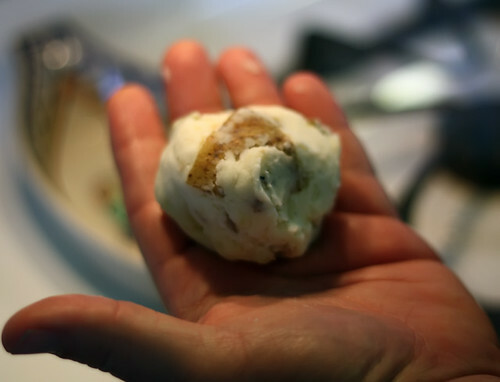 Take leftover mashed potatoes and form into a ball. Should be just under the size of a baseball. When butter is ready, place potato ball into pan. With a spatula, flatten the ball into a patty about 1/2 inch to 3/4 inch thick. Allow to cook undisturbed over a medium flame. About 5-6 minutes. 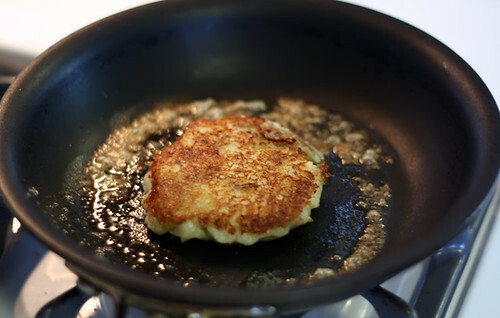 When potato patty is golden brown, gently flip over and cook other side to same doneness. When done, remove from pan with spatula and place onto plate. As soon as you flip the patty it’s time to start poaching your egg. Crack the egg and then gently, slowly and smoothly ease the egg into the sub-boiling water. It should immediately sink and start to form. 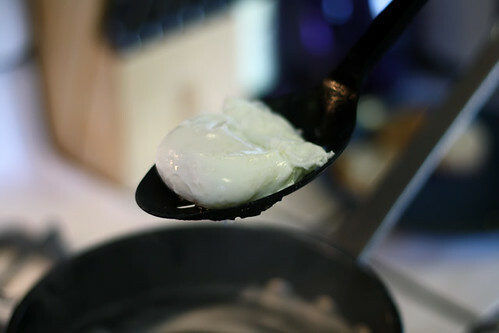 If necessary, use a slotted spoon to very gently coax the egg into shape. Soon after the egg will start to float and continue to cook in it’s final shape. Egg should be done in about 3-5 minutes. HINT #2: Remember, water boils at a lower temperature at higher altitudes, but the eggs take longer to cook. When egg is done, gently remove it from the water with a slotted spoon. Gently shake the spoon to make sure all water is drained away. Gently place on top of potato patty, salt and pepper to taste, and serve. This time around I served it along side a warmed leftover Korean Pork Chop (Daeji Galbi) and doused it in some Tapatio Sauce. Next time, I think I’ll try a Hollandaise Sauce for a Poachtato Benedict. HINT #3: I have obviously given you the recipe for just one Poachtato. To make more, just increase ingredients proportionately, except for water and vinegar. You should be able to poach several eggs simultaneously, and numerous overall, with the amounts already prescribed.